Stateside, at least, the Gluck recording never saw a full-price vinyl issue, with London Records - as Decca's American branch was then known - relegating it directly to the budget-priced Stereo Treasury line. The Eloquence CD, while not an unpleasant hour, helps clarify the reasons for that soft-sell. The Don Juan score itself isn't really from Gluck's top drawer. The composer's ear for orchestral timbre assures some coloristic interest. The overture's bright, reedy tang of unison oboes and violins yields to an airier "open" sound in movements where the flutes assume the doubling duties. In the Grazioso of Act III (track 12), duetting oboes riding on plucked strings are piquant and refreshing. But most of the themes themselves aren't memorable: the melodic gestures are too frequently generic, yet the occasional innovations - the unresolved long appoggiature in track 15, for example - don't come off either. And several brief movements, presumably intended to accompany specific bits of stage action, simply make a disjointed effect as "absolute music." An outstanding performance might have helped, but this one doesn't quite get over the hurdles. Some of the dance movements, especially the minuets (tracks 7 and 12), go with a pleasing lilt, even a soup�on of charm. An active harpsichord is clearly audible, to positive effect. In the Presto of Act II (track 9), the violins provide ample thrust without sacrificing tonal beauty, and their slow descending chromatics in track 11 fill out nicely. But elsewhere much of the playing, while unexceptionable, is pretty but static, lacking tensile strength, or even much clear direction. The Gavotte at the start of Act II (track 5) sings easily, but soft-edged attacks compromise the rhythmic address. The string tremolos are played clearly, but rarely convey the anticipatory frisson that surely is implied in the writing, especially in a stage work. Such moments foreshadow the thoroughly professional but phlegmatic, almost jaded playing of the St. Martin's of later years. Finally, the engineering is just decent. Certainly we can hear those violin/reed doublings clearly, but a slight overhang on the batteria militates against crispness and overlays an artificial gloss on the instrumental timbres. 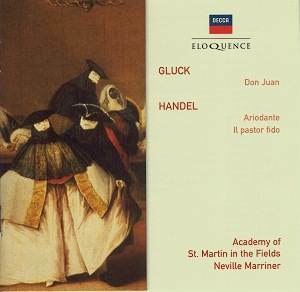 The Handel selections are drawn from a program that did get a full-priced release (Argo ZRG 686); presumably intended as mere makeweight, they rather show up the Gluck performance. Marriner projects his tempi, ideally chosen to balance forward drive and clarity, with alert rhythmic acumen. The orchestral sonority is firmly grounded in the bass; the quieter passages retain a full-bodied ease, with delicate oboes sharply defined against a trim, dark background of strings. And the sound is cleaner and more gratifyingly immediate. I'd recommend this album for the Handel tracks - which, incidentally, are misidentified on the box, and differently but still confusingly labeled in the booklet - but it might be worth waiting for Decca to reissue ZRG 686, which also included the overture and ballet music from Alcina, in its entirety. It'd be worth the wait, especially if filled out with, say, Marriner's Royal Fireworks Music. Don Juan is for specialists only.